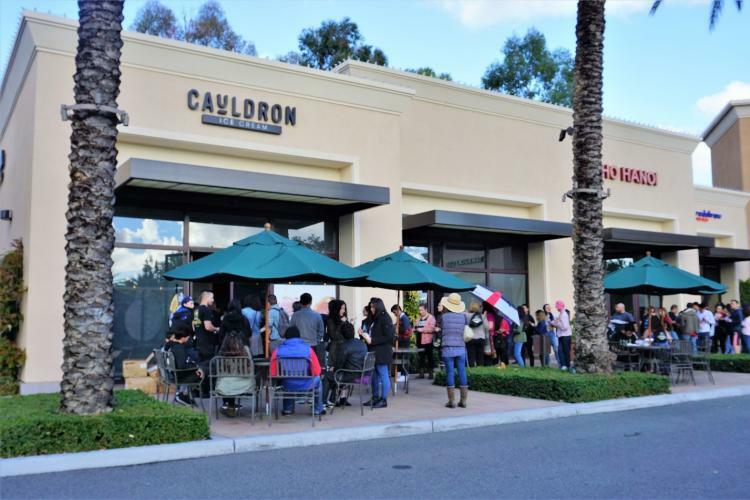 Despite the chilly and rainy weather, the Grand Opening of Cauldron Ice Cream in Irvine still drew over 400 people eager to try out the new store and its famed OG Puffle cone. A long line wound around the building located in the Cypress Village Shopping Center on the corner of Jeffrey and Trabuco. Cauldron Irvine joins six other locations throughout Southern California including Santa Ana, Temple City, Glendale, Pasadena, Chino and Convoy (San Diego). 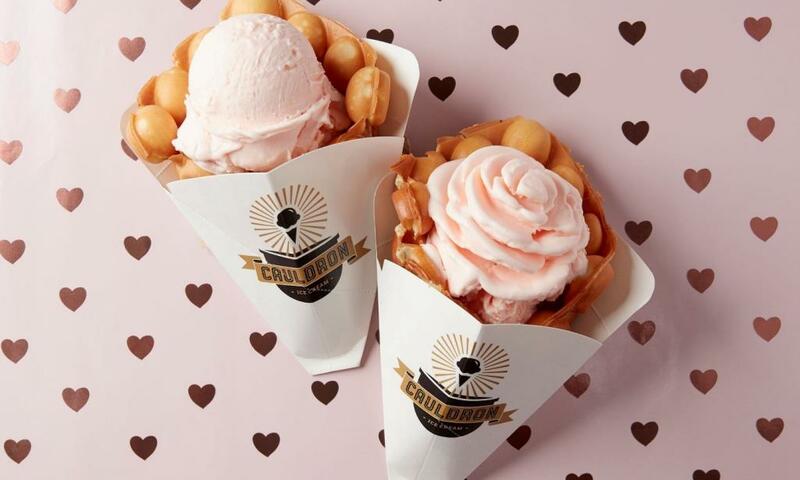 While the name Cauldron may not be a household name, many people have seen pictures of the rose shaped servings of ice cream served in a bumpy waffle cone on Instagram. The owners know the value of social media marketing and developed a product that would be aesthetically appealing. Co-owner James Ho said, “Our core value is freshly made ice cream, but people eat with their eyes first, so presentation is key.” With over 100,000 followers on Instagram, this strategy appears to be working. Cauldron is known both for unique flavors of ice cream—like Earl Grey Lavender, Maple Bourbon Crunch, and Vietnamese Coffee-- and the OG Puffle cone, which was inspired by a popular street food in Hong Kong. The cones were not a part of the original concept, but have definitely added to the popularity of Cauldron. As Ho says, “Its hard to beat cold, creamy ice cream served in a warm shell.” In case its really too cold outside to eat ice cream, Supa Hot Chocolate is also on the menu, a warm chocolatey beverage topped with plenty of creamy foam. 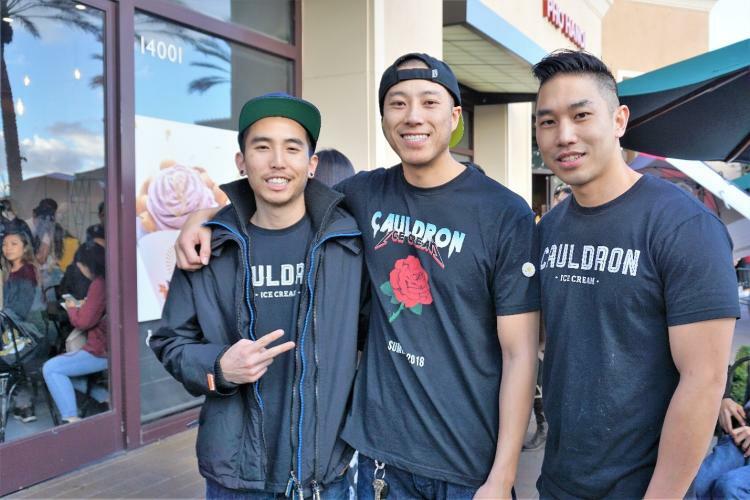 When asked why Irvine was selected for the sixth location of Cauldron, Ho replied, “Irvine is a family centric community, and ice cream is all about families.” Ho was joined at the Grand Opening by his two partners, Dan Nguyen and Steven Cao. Expansion of Cauldron continues with a third Orange County location in Garden Grove as well as other states and even Canada. Cauldron Ice Cream Irvine is located at 14001 Jeffrey Road and is open everyday from noon to 10 p.m.